If you are a parent and have been suddenly thrust into the world of kids' music, I am sorry. Most of the stuff out there is mind-numbingly bad. Nobody wants to hear Alvin and the Chipmunks singing, "Hot body, rock the party," or another rendition of "Finger Family", or a tune about a kid who brought home a baby bumblebee and then ate it (why?). And after five years and about a gazillion replays in my house alone, can we finally let "Let It Go" go? Chris Ballew, once the lead singer of The Presidents of the United States of America, has found new fame as kindie star Caspar Babypants. He writes super simple acoustic songs for the youngest listeners and their parents, such as the catchy tunes "Googly Eyes", "Pretty Crabby" and "Run Baby Run". Andrew Barkan and Polly Hall, AKA Andrew & Polly, are the hosts of the delightfully quirky kids' podcast Ear Snacks, which my daughter always requests on car rides. Listeners might not know that the music albums by the husband-wife duo are just as charming. "Grapes", their ode to the highly snackable fruit, is a song that may never leave my head. 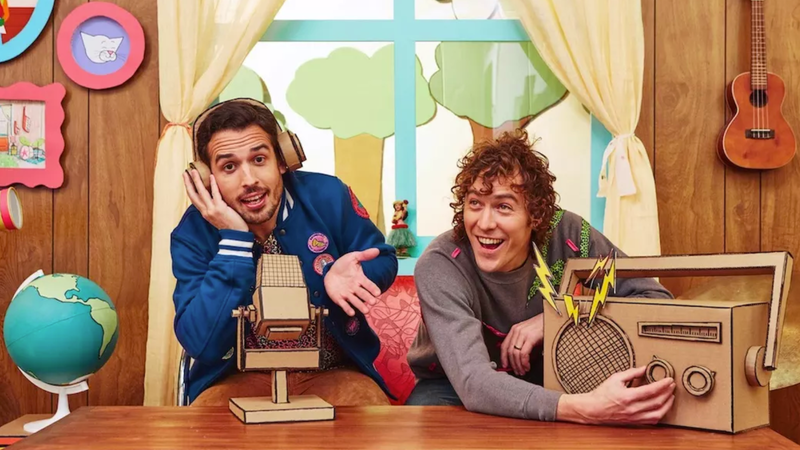 Brooklyn's Jason Rabinowitz and Jacob Stein, known as The Pop Ups, are masters of creating catchy, experimental songs for the lunchbox-toting set. Don't miss their 30-minute Amazon Prime special, "Great Pretenders Club", a rock-and-roll puppet musical. In the track "On Air", Stein imagines what'd it be like to have his own radio show, tossing in references to Duran Duran and Toto. The Grammy-winning group led by husband and wife duo Lucky Diaz and Alisha Gaddis has been producing energetic, irresistible pop hits for the past eight years. Their latest album, Made in LA, is their best one yet. Check out "Paletero Man", a tribute to the Mexican popsicle sellers that line the footpaths of Diaz' beloved Los Angeles. The New York Times called Justin Roberts "the Judy Blume of kiddie rock" for his rare ability to write songs about tough topics such as death, cancer and moving homes in a totally relatable, age-appropriate way. He just gets kids, as evidenced once again by tracks such as "Rolling Down the Hill" and "Must be This Tall" in his latest album Lemonade. I can't get enough of Roberts' classic song "Recess", which we could probably all use right now. Renee and Jeremy are good in this category. Some of it is a bit twee but their kid friendly cover of Give It Away by the Red Hot Chili Peppers is pretty masterful(see YouTube). Is your username at all based on Maximum the Hormone? Wow none of these are Australian, good job. And of course, the old stalwarts Hi-5 and The Wiggles themselves are still going and doing decent stuff even with new lineups. I find http://kinderling.com.au is pretty good with their music. I put on their digital radio channel while I'm working from home and looking after my daughter. They do a decent job of not having their music too kid-y and throw in a few non-kid songs for good measure so you don't go insane. I think I've heard quite a few artists from this list (as well as @whitepointer 's list).